Meet “Clancy,” a male golden retreiver-lab mix. He’s short but strong and has a smile that warms your heart. This beautiful young boy deserves a forever home. Tigger is a 2-year-old walker coonhound. 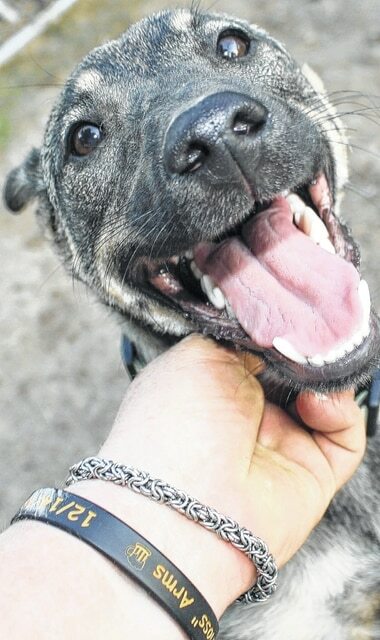 Fiesty is a happy dog who would make someone a wonderful companion. MEIGS COUNTY —The Meigs County Dog Shelter received many donations in June thanks to “Dog Day’s with Farmer’s Bank.” All six Farmer’s Bank locations served as drop-off sites for anyone wishing to donate to the shelter. While the shelter is always in need of donations, this effort was especially helpful, staff said. More than 430 dogs have been accepted in 2015 and the shelter is currently full. Volunteers are appreciated and the shelter is in need of people for Walk a Dog on Thursdays from 6-8 p.m. All that is required is that the volunteer bring some energy and a heart full of love. Now it is even easier to donate by going to Amazon.com Universal Wishlist for Meigs County Dog Shelter. All items purchased from Amazon will ship directly to the Meigs shelter. Meigs County Dog Shelter is located at 41790 Fairgrounds Lane in Pomeroy. For information contact the shelter at 740-992-3779.